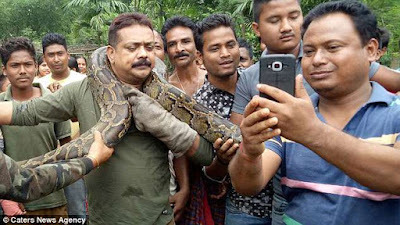 Sanjoy Dutta was leading a team that saved the 10 meter-long python from a forest in Jalpaiguri district of West Bengal, India. 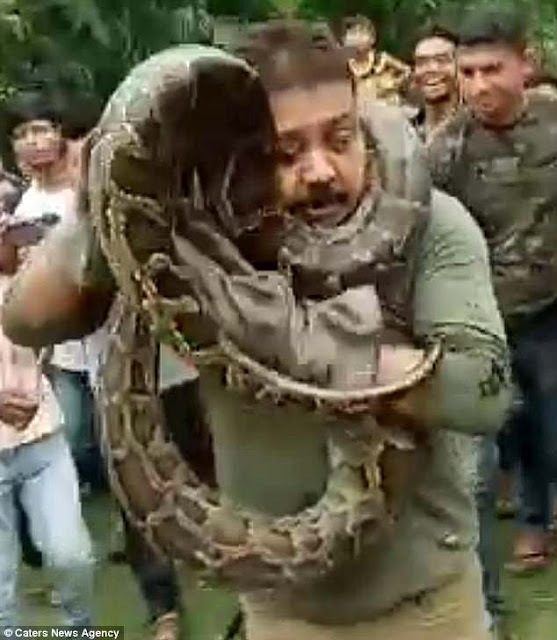 I have raced to loosen the snake's grip while another rescuer pulled the animal's tail in a bid to stop it cutting the circulation to the man's head. The brief video footage shows the officer holding the giant reptile wrapped around his shoulder while the crowd cheers at the officer's courage. All of a sudden the snake caught hold of his neck and tried to wrap his body around him. In a similar incident in April this year, a python tried strangling to snake charmer during a snake show in Mau, Uttar Pradesh, India. The man choked and collapsed showing visible signs of distress in the clip, but many of the crowd thought it was part of the act and did not realize the man was in trouble. He was later admitted to the hospital in the area after three people rescued him from the reptile's grip.